The latest Satellite imagery collected on November 27 by the Satellite Sentinel Project shows evidence of the intentional destruction of structures in the village of ‘Amara, located in the border state of Blue Nile, Sudan. 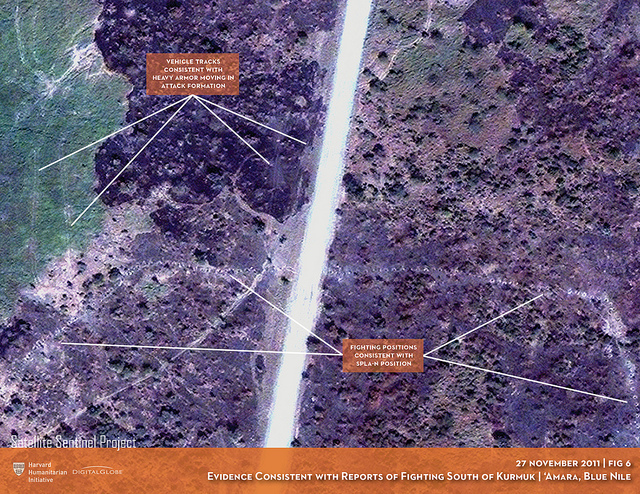 The imagery, provided by DigitalGlobe and analyzed by the Harvard Humanitarian Initiative, indicates a firefight apparently involving heavy armor or other tracked vehicles against dug-in fighting positions, uncontrolled burning of ground cover, the deliberate burning of individual structures consistent with civilian dwellings, and at least eight craters consistent with bombardment of the area by air-delivered ordnance. “These images and analysis provide further evidence of the Government of Sudan's disregard for the laws of war and human rights principles,” said Charlie Clements, MD, Executive Director of the Carr Center for Human Rights Policy at Harvard’s Kennedy School. The UNHCR estimates that 76,000 people have moved from Sudan to Ethiopia and South Sudan since August, mainly as a result of the ongoing violence. Read the full report: Blue Nile Burning: Evidence of the Destruction of 'Amara Village.